HCM City (VNA) – As many as 183 houses will be built near Dau Tieng lake in the southern province of Tay Ninh for Vietnamese expatriates returning home from Cambodia. 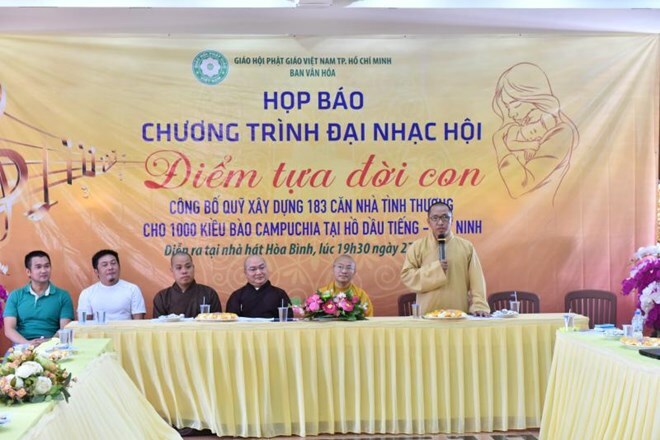 The houses are expected to cost 11 billion VND (484,000 USD), Most Venerable Thich Nhat Tu, head of the culture department under the Vietnam Buddhist Sangha’s Ho Chi Minh City chapter, said on August 21 adding that the organising board has mobilised 80 percent of total expenditure so far. The houses will help Vietnamese expatriates stabilise their livelihoods, he underlined, expecting additional financial contributions from donors. The project will be announced at a grand music festival to held by the Vietnam Buddhist Sangha’s Ho Chi Minh City chapter on August 27 on the occasion of the annual Buddhist holiday of Vu Lan (Ullambana) festival, the Most Venerable added. The grand music festival, scheduled at Hoa Binh theatre in Ho Chi Minh City, will stage brilliant performances to express gratefulness to parents. The Most Venerable said that Vu Lan festival is not only held for Buddhist followers but it has become a national spiritual festival for all Vietnamese people to promote beautiful value of Vietnamese culture and social morals. The festival falls on the fifteenth day of the seventh month in lunar calendar, with this month known as the spirit month in Buddhism. On this month’s full moon, wandering souls are believed to return to their former homes. The festival is based on the legend that once when mediating, a Buddha’s disciple named Muc Kien Lien saw his mother suffering hell’s tortures.